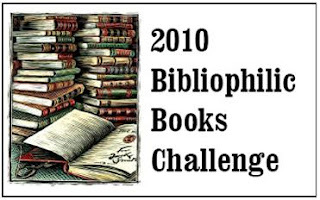 This is my organizational post for the Bibliophilic Books Challenge. I am excited about this one, because I thought I had imagined it, but it turns out it really exists. The point is to read books about books. They can be fiction or non-fiction, so there are plenty to chose from. There are many qualifying books on my TBR shelves right now, and I have really been in the mood for them. I signed up for the "Bibliomaniac" level, which means I have 12 to read by the end of the year. I do not have a final list yet, but I have several in mind. There are enough choices on my TBR shelf that I chose all 12 from what I have now. There are a lot of author biographies on my list. I think they fall within the guidelines for the challenge, because they discuss the authors' books. But if they do not count, there are plenty of other choices on my list. Housekeeping vs. the Dirt by Nick Hornby (not reviewed yet). This post was last updated on September 22, 2010. That's a great list! Happy reading! I will be reading for this challenge right along with you:) I will have to spring for the Hornby books as well since my library system only carries his fiction. Happy reading! Thanks! These books are all so appealing to me right now that I am tempted to race through. But I want to pace myself because I am looking forward to participating through the year. Wow, this is a great list! Looking forward to your reviews. Hmmm. You mentioned a lot of books that I was not aware of... and, quite a few authors who I have read yet. An excellent list. I've read and enjoyed Hornby's "Shakespeare Wrote for Money" and Fadiman's "Ex Libris." I HIGHLY recommend D.H. Lawrence's "Studies in Classic American Literature"; it takes some amazingly insightful imaginative leaps. (Caliban, the quintessential American?) And I always pair it in my mind with William Carlos Williams' "In the American Grain," a more sober but deeply insightful exploration of classic American writing. Between them I think they really nail something important about the growth and identity of American culture -- and of course, both are terrific writers. I know, this challenge seems too good to be true :) I don´t have a set one yet and I´m noting your list down. Good luck with the challenge! Monstrosity -- Thanks! I'm already behind on my reviews. I have one more to do to catch up. Bob -- I bought Ex Libris because you liked it so. I am looking forward to it. Bina -- Thanks! And good luck to you. Isn't this a wonderful challenge. I've already read Agatha Christie's Secret Notebooks - wonderful - and now I'm weighing up a few possibiliteis for my next book. You have a great list - I'll be back to see what you make of the books. Sounds like fun! I finished readign Shadow of the Wind not too long ago, a book about a book, and liked it. Your list looks great. Happy reading! The Anne Fadiman books are lovely, especially Ex Libris. It is best read in a warm sunny room (though possibly I only think this because that's where I read it). The Bookshop is also lovely. A lot of the other books on your list also look intriguing; thanks for linking me to them. Thanks for commenting on my post. I decided to add a list of possiblities. Not that you need more ideas LOL. Hey there, thanks for pointing out your list! You've got some really interesting choices on there. I actually say Ex Libris in a bookshop a couple of weeks ago and thought that it looked like an interesting one from this challenge. I hadn't really thought about reading Speak, Memory for the challenge, but Nabokov is grand, so that could be a good pick, too. I also must read Pale Fire this year, at last. Wonderful list! I see several there that I'll be adding to my list of possibilities for the challenge. Also several that I've read and enjoyed - especially The Club Dumas. That's one I'd like to re-read one of these days. Good luck with the challenge! Leah -- Thanks for visiting! You have a great blog. I'm glad I found it because of this challenge. fleurfisher -- You caught my curiosity with the Agatha Christie book. I want to go find it. Sharon -- Thanks for the tip. I'll come by and read about Shadow of the Wind. Anna -- Since I'll be reading the Fadiman book in Oregon in February, I'm afraid it won't involve a warm sunny room. I'll have to make due with a fire in the fireplace and a huge mug of tea. Callista -- thanks for the link. I'll go review your list and see if I get more ideas. Jenny -- I am looking forward to Speak Memory. This challenge will be the kick I need to turn to it. Enjoy Pale Fire. It is one of my Top 10 favorites. Tracey -- It is a perfect challenge! Have fun with it! I look forward to seeing what non-fiction books you pick. Joy -- I admit that I bought The Club Dumas because that is my last name. :) But now I am looking forward to reading it.